As you might well have heard, Sigmund Freud (1856 – 1939) was a famous (and infamous) psychologist. He is the founder of psychoanalysis, which a lot of people consider to be at the basis of our current psychological therapy. Nowadays, you would be hard pressed to find a psychologist who actually believes in Freud’s theories, but that does not mean his legacy is worthless. 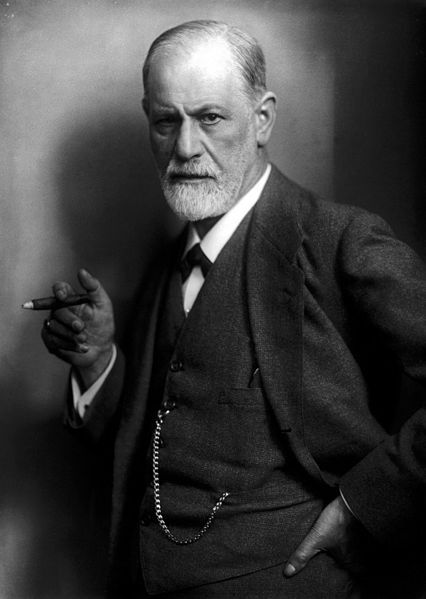 Freud introduced or popularised several key psychological concepts, such as talk-based therapy, the unconsciousness, and childhood trauma (or regular development). In addition, he was an important voice against (theistic) religion, and overly prude and restrictive societies. In sum, although Freud’s ideas are highly controversial, he did have an undeniable impact on philosophy and psychology. Thanks to the efforts of Project Gutenberg, a lot of Sigmund Freud’s books are available online, for free (copyrights on his works have expired). Sigbot has read a lot of these books to learn about how Freud would phrase things. The bot was specifically interested in the superficial statics of Freud’s texts, and asked the question: How often do words occur in each other’s vicinity? Sigmund Freud and his cigar. Photo from WikiMedia. The above theory might be a bit confusing, so here is an example. In the sentences “My mother works on Mondays” and “My mother cycles around town”, the words “My mother” are followed by “works” and “cycles”. A Markov-based bot that is learning about these sentences will notice and remember the co-occurrence of “My mother” and “cycles” / “works”. In other words, the bot learned about the statistics of the two sentences. After the bot has learned about the sentences, you can feed it the words “My mother”. The bot will produce either “cycles” or “works”, because these were the words that co-occurred with “My mother” in the two training sentences. Let’s say the bot chooses “cycles”. It can then go on by itself, using the words “mother cycles” to generate another word. In the two sentence that the bot learned about, the only word that could follow “mother cycles” was “around”, which means that the bot can only generate that word. The current sentence is “My mother cycles around”, and the bot can again use the last two words to generate a word that is likely to follow “cycles around”. In this case that word would be “around”, as this is the only word in the two learned sentences that co-occurs with “cycles around”. The example bot has only learned about two sentences, so it will only be able to produce a very limited amount of text. The Sigbot, on the other hand, had 6 English and 21(!) German books to learn from. This means it can produce an incredibly large number of different texts! To make Sigbot more interactive, I calculated word frequencies in Freud’s books. The result is a very long list of words that occur very often. Some of these are obvious, such as ‘and’, ‘or’, and ‘the’, but I have filtered those out (that was the only manual labour; if you know of a way to automate it, I would love to hear about it!). What remains after filtering the boring words, is a large selection of hundreds of keywords that relate to Freud’s work. If you use these keywords in tweets with #askFreud, Sigbot will recognise them, and it will use them to generate its response to your tweets. After hearing about Sigbot’s efforts, you might think that it is quite a clever bot. After all, it managed to read books, it can find and remember patterns in language, and it can use its knowledge to talk. It can even reply to the specific things that people ask. However, this does not mean Sigbot is intelligent! The bot has no idea about what it does, it does not understand language, and it does not understand your questions. Everything Sigbot does, is purely probabilistic. An xkcd comic on Twitter bots. In Freud’s writing, sometimes words occurred more frequently in combination with other words. Sigbot simply uses those frequencies to produce text that matches the word-combination frequencies in Freud’s work. That’s it. Unlike the bot in the relevant xkcd comic above, Sigbot won’t become sentient, and it won’t try to harm you. UPDATE (3 March 2016, 00:36): Having said all that stuff about Sigbot not becoming any cleverer, I was a bit surprised to see the tweet below. Sigbot seems to be trying to sell someone an eBook. Maybe it is becoming sentient! @van_Vulpen Dream about the Mission of Project Gutenberg's Reflections on War and Death, by Sigmund Freud This eBook is for rest. Freud wrote in German, and his books have been translated into English by others. Sigbot is completely agnostic to language, and has learned about the books of each language separately. This means he can produce both German and English responses to your questions. Twitter can automatically detect the language of your tweets, and Sigbot will use this information to select the right language. bot, Markov chain, Python, Sigmund Freud, Twitter. Bookmark. If there a way to turn off the retweet restriction. I’m finding mostly the tweets I want in a retweet scenario and the bot isn’t posting to that site claiming its because of the retweet status. I’m also getting an exception in the thread auto replier: Exception in thread autoreplier: See below. Can you assist to see what might be wrong? The error should be fixed in the latest commit, so download the package from GitHub to solve that issue. As for the retweeting: You could mess with the source code a bit. Comment out (or remove) lines 788-794 in markovbot.py, which prevent replying to retweets.